My best friend, Carissa, is Italian, and I’ve had the pleasure of eating a few of her family’s favorite dishes, including homemade gnocchi, chicken parm, and fettucini Alfredo (thanks, Paul!). I even dragged her to Wisconsin this past fall and forced her to make my parents and grandma a homemade Italian feast. My grandma loved her marinara sauce so much that she got the recipe from her and uses it all the time. My grandma is a smart woman—Carissa’s marinara sauce is seriously amazing. There have been late nights after a couple (dozen) drinks that Carissa and I have literally eaten the sauce straight out of the tupperware with a spoon. Don’t worry, Mom, I was kidding about the dozen drinks part. Anyway, I finally decided to take a go at this homemade marinara, but, as always, I needed to make it my own, so I decided to add some Italian turkey sausage and red pepper flakes to the recipe. I had actually planned on adding mushrooms as well, but I decided to get Alzheimer’s for a minute and forgot them in the bottom of the fridge. You should add mushrooms, though. I also made zoodles (zucchini noodles) with a vegetable spiralizer to act as the “pasta.” If you don’t have one of these, I suggest getting one from Amazon. I’m obsessed with it. So, I made this for my brother last week when he came over to build my bed. That’s kind of our thing—he builds me furniture and I compensate by feeding him wine. I mean, food. Don’t worry, Mom, I was just kidding about the food. I was a little worried about this dish not turning out because I had never made the sauce nor the zoodles before, but my brother kept saying, “This is so f—ing good,” after every bite, so I think it was alright. If you have never tried making homemade marinara sauce, I suggest you do so with this recipe. So simple, so delicious. Start by mincing the garlic. Drizzle some olive oil in a medium-sized sauce pan, add the garlic, and saute over medium heat for one minute. Add the sliced mushrooms and continue to saute for a couple minutes, making sure not to burn the garlic as it will turn bitter. Add the crushed tomatoes, Italian seasoning, red pepper flakes, salt, and pepper and stir well. Taste and adjust seasonings. Cut the ends off the onion and peel, but leave whole. Nestle the onion into the sauce and throw in some fresh basil and parsley leaves, whole. Cover and simmer on low for 30-45 mins, stirring occasionally. 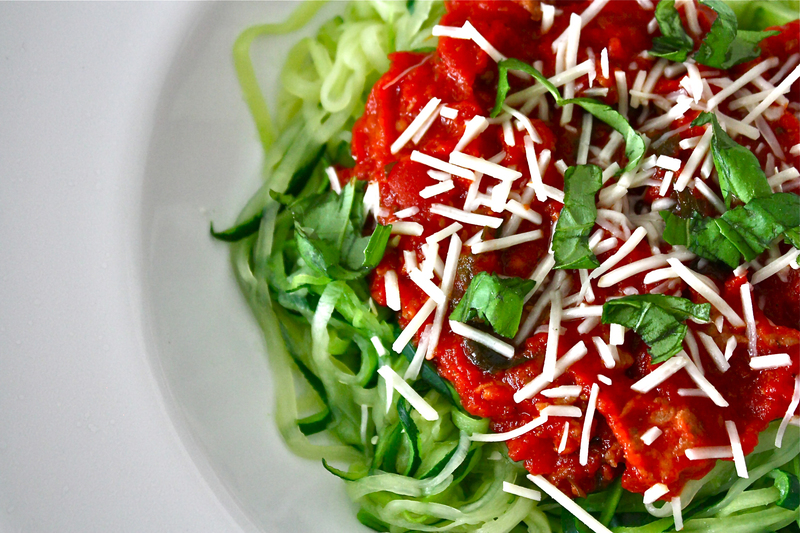 While the sauce is simmering, use the vegetable spiralizer to make the zoodles (one zucchini per person). Set aside. In a saute pan, brown the Italian turkey sausage. I used Jennie-O links (brat sized), so I needed to squeeze the meat out of the skin first. When the sauce is done, ladle it into pan with the sausage, little by little. When you have the desired amount of sausage-to-sauce ratio, allow it to cook on low for a few minutes to meld the flavors. Meanwhile, add the zoodles to a pot of boiling water for 1-2 minutes to warm them. You don’t want to cook them fully or they’ll turn mushy and lose that toothy pasta texture. Drain well. Add the zoodles to a serving bowl and top with the sauce. Garnish with parmesan, fresh basil, and red pepper flakes. *You may have a lot of leftover sauce, depending on the amount of people you’re cooking for. Freeze extra sauce to keep fresh.